Ever since my childhood, I have always felt a deep connection with Native Americans. At the Ramallah Friends School, a Quaker institution established in Palestine over a century ago, we learned about our shared history as indigenous peoples who have faced ethnic cleansing by European colonists and the importance of nonviolent resistance for freedom and dignity. 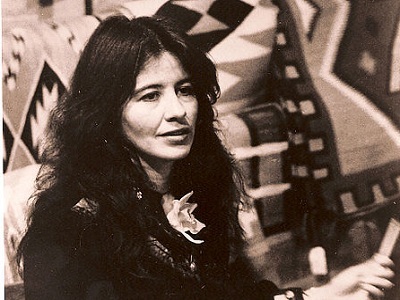 Many Palestinians and those in solidarity with our struggle had hoped that Joy Harjo would be principled in heeding the calls of another subjugated people. We have been profoundly dismayed by her recent decision to accept funding from Tel Aviv University, an Israeli state institution, and to not only perform there on Monday but also to serve as a Writer-in-Residence. Soon after hearing this disappointing news, Native American peers of Harjo, including Robert Warrior, called on her to boycott the event. The Palestinian Academic and Cultural Boycott of Israel (PACBI) sent an open letter to Harjo imploring her to honor the boycott. A USACBI petition generated over 2,000 signatures within 36 hours. Harjo disregarded these requests and announced that she would proceed with the performance. Her statement expressed sympathy for Palestinian and Jewish suffering without acknowledging that many American settlers—like their Israeli counterparts—had also faced persecution in Europe, and that Jewish and Israeli voices have been invaluable to the BDS movement. Harjo crossed the picket line. She helped provide legitimacy to an institution that sits above the ethnically cleansed Palestinian village of Shaykh Muwannis while supporting the Israeli military occupation which is illegal under international law. In Israel/Palestine, the displacement of Native Palestinian Christians and Muslims continues in an Israeli campaign to maintain a “Jewish state” privileging one ethno-religious group and institutionalizing segregation and discrimination with impunity. Israel just announced approval for 3,000 new Jewish-only settlement units in East Jerusalem and the West Bank. Each day, Israel steals more Palestinian land, bulldozes more homes, uproots more trees, and detains more children. The Palestinian cry for peace and justice continues after over six decades of dispossession. We look to people of conscience around the globe to hear this cry. Considering that Israel is the world’s largest recipient of U.S. aid, American tax dollars prolong the oppression of Palestinians. Although this Trail of Tears continues, we have the power to stop it. The Boycott, Divestment, and Sanctions (BDS) call was issued in 2005 by over 170 Palestinian civil society organizations. This has become a global movement that draws inspiration from the South African struggle. Israel was one of apartheid South Africa’s greatest allies. Israel adopted many of South Africa’s policies which have been fundamental to the apartheid system imposed on indigenous Palestinians. Apartheid came to an end in South Africa as a result of external pressure through a global boycott, and the movement today boycotting Israeli organizations that are complicit in segregation and ethnic cleansing has been growing dramatically. The power of this approach comes from its effectiveness, nonviolent nature, targeting of institutions rather than individuals, and our demands for basic rights and Israeli compliance with international law. I still have not received a response from Harjo. No amount of pleading could move Harjo. She was persistent on accepting funds from—and granting legitimacy to—an institution complicit in Israeli colonization of Palestinian lands. Sarah Schulman, an esteemed writer and activist, who is lesbian, Jewish, and a supporter of the BDS movement also reached out to Harjo in an effort to convince her that the trip could instead engage Israelis and Palestinians in Tel Aviv and in the West Bank at venues that abide by the boycott guidelines. Schulman, too, had previously been invited to speak at Tel Aviv University and declined in order to honor the BDS call and used that as an opportunity for a solidarity visit that she chronicled in her recent book. Harjo refused Schulman’s request. As someone with Native American ancestry, I am shocked, saddened and frankly disgusted that Harjo would turn her back on fellow oppressed indigenous peoples. Seriously, I cannot for the life of me figure out the motivation, the mental gymnastics necessary to rationalise the act of accepting money and a position from oppressors, knowing what our (and your) people have endured, and in your case, endure up until this day. My heart and my support goes out to you, my fellows. Know that you are not alone even though some are enticed by physical currency, it cannot replace the human currency of compassion and solidarity!